Thank you for considering GPS Track Time, LLC as your host for high performance driving. Please understand that safety is our number one priority. Our mission is to provide the safest and most fun with your car at the best possible value. Our dedicated team and partners have all been there. 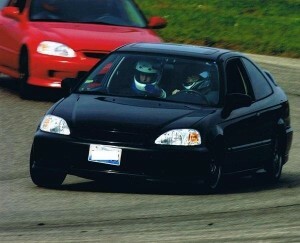 We remember our first drag race, autocross and track events. Given, we will do our best to make sure you are well prepared before the event date. Classroom meetings will also be scheduled for beginners to reflect lap sessions throughout the day. Remember, there is absolutely no competitive aspect to our events. Passing is only allowed with permission on dedicated straights of the track. Participants who drive aggressively after a warning will be banned from the track. There is also no live timing at our events to prevent potential “benchmarking”. Focus should be on technique rather than timing or catching up to the car in front of you. Beginner’s education material are in PDF format and designed to be viewed with Adobe Reader, which is available free from Adobe here . First, let’s talk about one of the most misinterpreted performance figures in auto journalism: braking distance. The common myth is- bigger brakes will simply help you stop your car faster. This is false. In short, your minimum stopping distance is dependent on your tires while your brake pads, rotors and fluid will help you maintain said distance over repeated heavy use. For more information about tires and your brake system, please read “Pulp Friction” by James Walker Jr., (Robert Bosch Corporation anti-lock braking systems engineer) found by clicking here. I also recommend reading tire review and comparisons such as Car and Driver’s “Monsters of Grip” Nine Summer-Performance Tires Tested” comparison for more on how high performance street tires compare to one another found here and its data results here. The Tire Rack website and Grassroots Motorsports magazine is also a great source for information. Now, let’s shift to brake pads and rotors. I bring this to attention because they are often overlooked by beginners when preparing their cars for a track day. Personally, I spent a lot of time thinking about my next power or suspension mod when I was younger. Improving the sound and look of my car made sense on the streets. However, at the track, emphasis should be directed towards how your brake system deals with heat. Typical stock/street pad applications were designed with lower: noise, brake temperature operation, brake dust, and longevity in mind. Unfortunately, these qualities do not necessarily mean a very wide and/or high temperature range. High performance brake pads on the other hand, are engineered to continue to “grab” your rotors at much higher temperatures, as a result from repeated hard stops experienced at the track. Speaking of high temperatures, your rotors do most of the absorbing and dissipation of the heat. Given, larger and thicker rotors in general, are able to store more heat, circulate more air, and dissipate the stored heat more quickly. Hence, you will find larger rotors on performance oriented models throughout the auto industry. For example, the 2013 BMW 328i has “only” 12.3 inch front rotors while the M3 features 14.2 inch rotors. “Brake fluid is possibly the single most neglected component of the automobile. Most high performance drivers check their tire pressures and change their engine oil at frequent intervals, but virtually no one ever changes the brake fluid in their street car. The function of brake fluid is to provide an incompressible medium to transmit the driver’s foot pressure on the brake pedal through the master cylinder(s) to the calipers in order to clamp the friction material against the discs. The foot pressure is multiplied by the mechanical pedal ratio and the hydraulic ratio of the master cylinders, booster (if used) and caliper piston(s). This is a simple concept. When fresh, all brake fluids are virtually incompressible and the system works as well as its mechanical and hydraulic design allows. There can be, however, significant problems in the proper functioning of brake fluid. Overheated brake fluid will boil in the caliper (Over time, moisture gets into the brake system and lowers the brake fluid boiling point). Boiling produces gas bubbles within any boiling fluid. Gas is compressible so boiling brake fluid leads to a “soft” brake pedal with long travel. In extreme cases overheated brake fluid necessitates ‘pumping the brake pedal’ in order to get a pedal at all” (or even complete loss of your brakes!). In short, please make sure you have fresh brake fluid. Moreover, we highly recommend performance fluid such as Motul RBF 600 due to high dry AND wet boiling points.